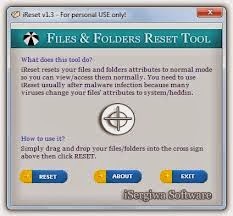 iReset is a small-sized and portable utility that makes hidden and system files and folders visible, thus allowing you to easily access and manipulate them. It can be handled even by users with limited or no experience in software applications, since it doesn't include configuration settings. As installation is not a prerequisite, you can just drop the executable file somewhere on the hard disk and click it to run. Otherwise, you can move iReset to a USB flash drive or similar storage unit, in order to run it on any workstation seamlessly. An important aspect to take into account is that the Windows registry is not updated with new entries, and files are not left behind on the HDD after removing the program. The interface is based on a small window with a plain and uncomplicated layout, where you can use the drag-and-drop support to move files over the cross sign, and click the "Reset" button to initialize the task. As expected, iReset is very low-demanding when it comes to system resources, running on low CPU and RAM. It has a good reaction speed and commits modifications rapidly. No error dialogs were shown in our tests, and the app did not hang or crash. All in all, iReset serves its purpose.